I just noticed that it’s Wednesday, when did that happen? Time has just totally gotten away from me this week. Next thing you know it will be the 4th of July! Before it gets too late, I need to show you my photos of the Springfield Antique Show And Flea Market in Springfield, Ohio that I attended two weekends ago. It really runs the gamut from fine antiques, to high end shop wares, to rusty junk right out of a barn (my favorite), to good old fashioned flea market crapola (that’s French for stuff). Lots of industrial items at the show this year. Many, many vendors had these letters. 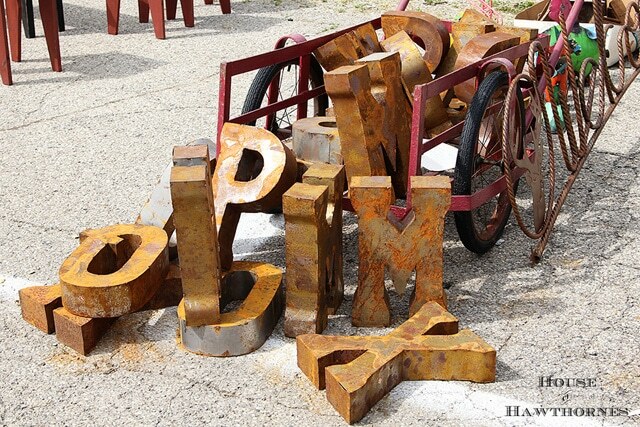 So many that I would guess that they are new metal letters made to look old with a faux rust technique. Not accusing anyone of anything shady here, but unless an alphabet soup factory just exploded, it just doesn’t make sense. This green and red hutch was calling my name. It must have been calling someone else’s name louder though, because when I went back later to check it out again, it was gone. 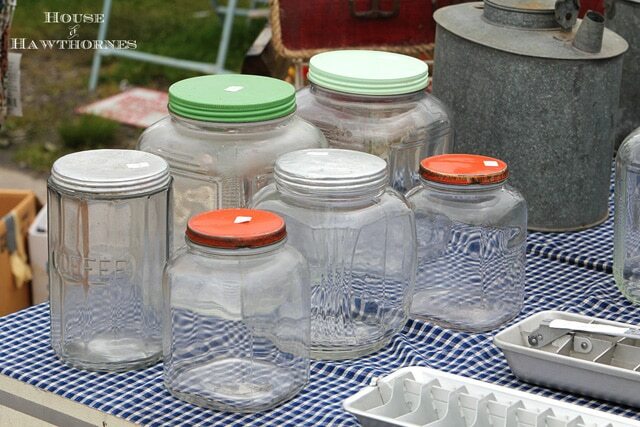 Lots of jars similar to the one I used in my terrarium tutorial. Donna at Funky Junk Interiors was nowhere to be seen, but her notoriety lives on in rural Ohio. 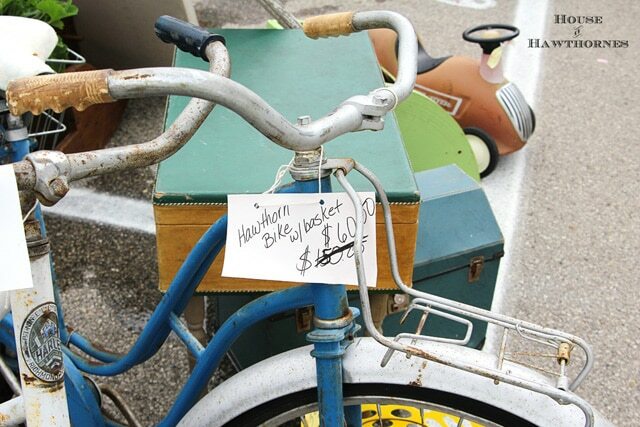 And last, but not least, a Hawthorn bike. I should have bought this on name alone, but I just couldn’t part with $60. I’m off to get a pedicure, which I treat myself to once a year (I just do it myself the other times). Gotta get the hooves back into sandal shape. 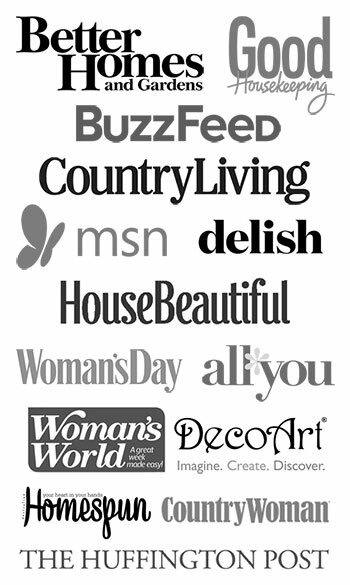 Linking with Be Inspired and Feathered Nest Friday, Saturday Night Special. What fantastic pictures. Looks like a great atmosphere. Enjoy that well-earned pedi. 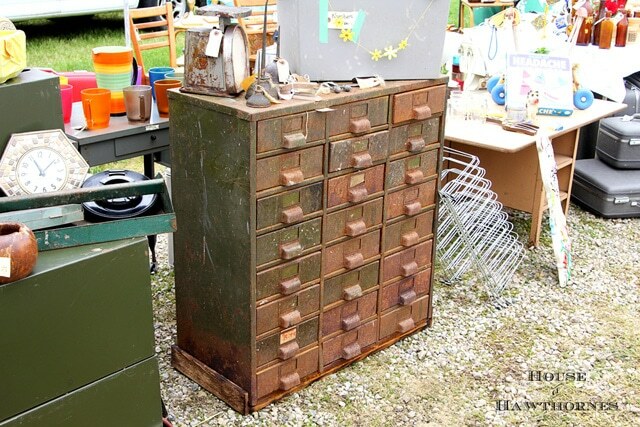 Love going to those flea market antique things too. But I never know when and where. LOVE that old typewriter and the card catalog. I’m with you about those letters. Very suspicious that they all are so perfectly and uniformly rusted. I love that type writer! Love the letters,too, even though they have to be new. The bike was too high. So, what did you walk away with? I never get to attend this kind of flea market. Great stuff. I liked the toys and the old typewriter. 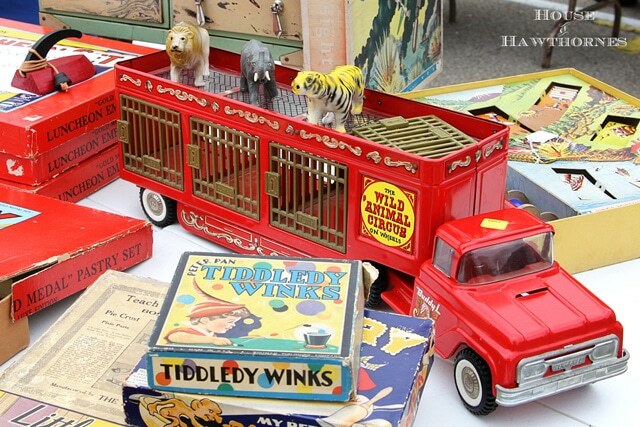 I have never been to a flea market either, putting that on my list of things to do this summer. Thanks for showing us these fun photos. Every picture had my heart pounding. 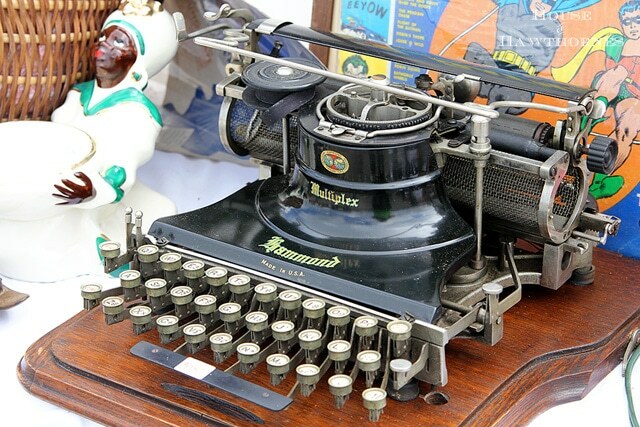 I especially love that fabulous antique typewriter…those are so darn pricey around here. I concur with the rusty letters. I love them, but when I see too much of the same good thing, it’s makes me wonder what century they were born in. Thanks for sharing all these treasures. 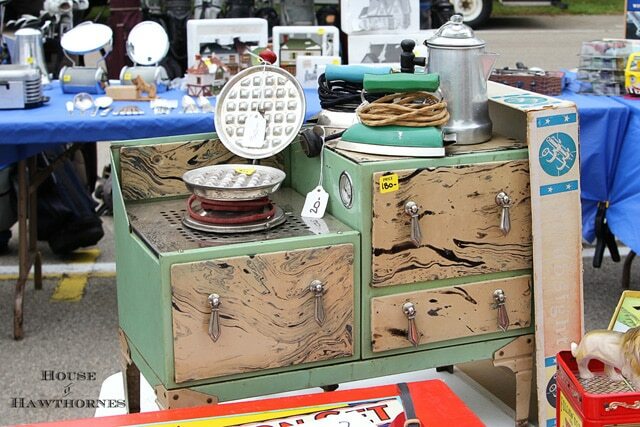 The Springfield Flea Market is on my “to-do” list. Your pictures are making me want to go sooner, rather than later! Is the whole market do-able in a full day? Or, did you have to forgo some sections? How were the prices? Pam that looks like a great market! 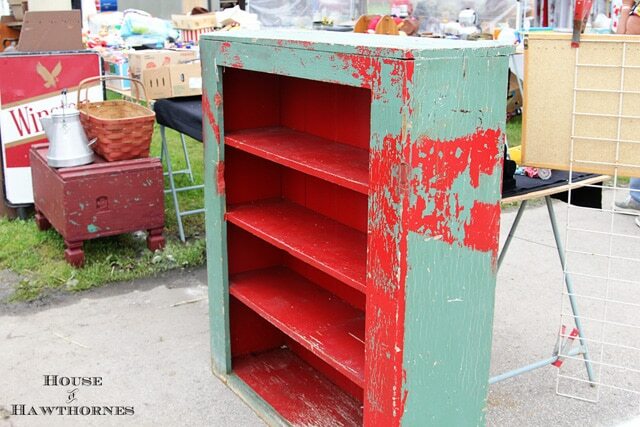 Love the red and green hutch that got away! Wish I had seen ya! I was there Fri. and Sat. I found a few things- nothing big, though. I finally made it to Polly’s last week with Debby. What a cute shop! That looks like my kind of place! The industrial look is so in–looks like a lot of fun stuff! I do the pedicure thing once a year too—haven’t done it yet and I’m already in flip flop season (I usually stay in flip flops Mar-Sept, I hate wearing shoes)My daughter tells me I need a pedicure 🙂 Hope you enjoyed yours! @Tete – I ended up with a old galvanized sap bucket and a metal picnic basket. So much more I could have bought, but was trying to conserve my money! @Vickie – Nothing on that guy’s table was reasonable. I think that stove was $150ish. I do wish I would have kept my metal kitchen set I had when I was a kid though. 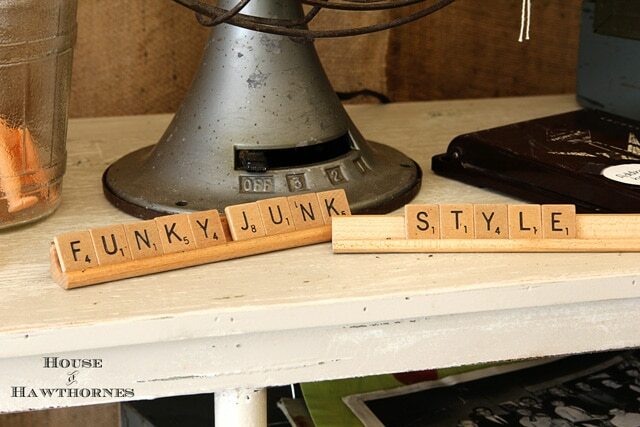 @JunkStuffTreasures – definitely doable in a day. Prices were good. Some a little high, but most pretty reasonable. I was there on the last day of the sale so a lot of people where trying to get rid of stuff before having to load it back up to go home. My goodness, my goodness, my goodness! Love it all!! Ooo 🙂 looks like a fun place to shop at.. Loved the green and red hutch.. 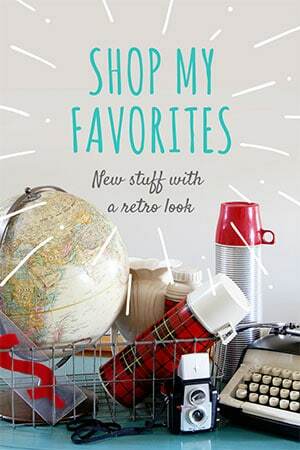 So much eye candy…I would have loved to shop there with you! Thanks for taking us along. It’s been storming here for days and I doubt I’ll get out to many, if any, sales tomorrow. It was fun shopping with you and not having to wear my rainboots or get my hair wet! I’m not a purist, but I hope whoever was selling those letters at least disclosed that they are not truly old! I’ve often been surprised how many unsuspecting souls get hoodwinked.